Oyster mushrooms, or in Latin is called Pleurotus sp. a mushroom consumption. That is, non-toxic so that it can be eaten. Cultivated oyster mushrooms which many in Indonesia in general is white oyster mushroom (Pleurotus ostreatus). This species has a branched stalk. Called the white oyster mushroom because this fungus is a white, rounded hood 3-15 cm. 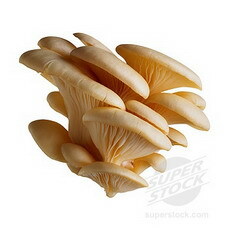 Actually there are several kinds of oyster mushrooms worth eating, among other things: gray oyster mushrooms (Pleurotus cystidius), this type of mushroom stems unbranched, round cap with a diameter smaller than the white oyster. Oysters have a superiority gray sweetness. There are also dry in the sun king oyster (Pleurotus umbellatus), or King oysters that are not branched, large cap brownish and cracked edges. Benefits of Oyster Mushroom Protein content of oyster mushrooms on average 3.5 to 4% of wet weight. Means that the protein two-fold higher than the asparagus and cabbage. When calculated on the dry weight of oyster mushroom protein content is 19-35%, while rice 7.3%, wheat 13.2%, 39.1% soy and cow milk 25.2%. Oyster mushrooms also contain nine essential amino acids that can not be synthesized in the body of lysine, methionine, tryptophan, threonin, valine, leucine, isoleucine, histidine and phenylalanine. Oyster mushrooms fat content at least 72% of total fatty acids are unsaturated fatty acids. Oyster mushrooms also contain a number of important vitamins, especially vitamin B group, vitamin C and provitamin D which is converted into vitamin D with sunlight. The content of vitamin B1 (thiamine), B2 (riboflavin), niacin and provitamin D2 (ergosterol) was quite high. The fungus is also a good source of minerals, the main mineral content of the highest is potassium (K) and phosphorus (P), sodium (Na), calcium (Ca) and magnesium (Mg). However, the fungus is also a good source of minor minerals because they contain zinc, iron, manganese, molybdenum, cadmium, and copper. Concentrations of K, P, Na, Ca and Mg reach 56-70 percent of the total ash, with very high potassium content reaches 45 percent. This principle is easy oyster mushrooms cooked into various kinds of dishes, from stir-fry, salad, tempura, soup until other, more complex dishes. Oyster mushrooms are still hesitant to consume this?